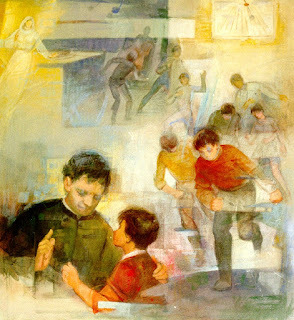 Speaking of being favourites and being favoured, I remember distinctly reading long time ago how the boys at the oratory fought with one another claiming to be the favourite of Don Bosco! At the oratory there were boys from different backgrounds, though mostly poor, and of different ages. Some had only seen the worst of life. Others had for sometime been loved and cared for. Those experiencing love for the first time at the oratory, for that matter anyone at all showing some concern for them, surely would have felt great. Of these some would have wanted 'more', failing to cherish what they already were experiencing. Others would have felt great just to be loved. They would not have bothered whether someone else is loved 'greater' than them. For them to be loved was in itself a great experience. However, am sure only those who felt contented with the love they received, felt 'privilege'd in that sense, AND wished to share that privilege, made a difference in the lives of others. The rest, simply drowned in the pool of 'privilege' - never thinking beyond themselves.